Hmmmm. It looks as though years of folks complaining about the size and scope of E3 has finally hit home, as this story reveals. We'll see how well it actually works. Last month I attended the annual Museum of Comic and Cartoon Art's (or MoCCA as it's referred to) annual show in New York City. For those not in the know, the MoCCA show is one of, if not the biggest, alternative and small press comic book shows in the U.S.
Art comics publishers like Drawn and Quarterly, small press stalwarts like AdHouse and lots of folks with nothing more than a pen, paper and access to a copy machine all congregate during this weekend to offer their wares for an interested public. Having finally made my way through the pile of books that teetered on my table, I thought I'd do a quick run-down of some of the more notable titles I nabbed at the show. Since most of the books listed here might be a tad hard to find, I've included Web site addresses, as well. "Drawing Comics Is Easy! 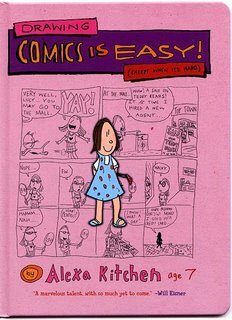 (Except When It's Hard)" by Alexa Kitchen, DKP, 176 pages, $19.95. This book was easily the most delightful surprise of the show. Only 7 years old when she penned this how-to book (she's 9 now), Alexa Kitchen, daughter of publishing mogul Denis Kitchen, seems to intuit more about comics than most of her much older peers. Yes, her art is rough and unpolished (to be generous), but don't let that fool you; her strips have a sense of rhythm and composition that is remarkable. I hope she keeps on drawing well into adulthood. "Girl Stories" by Lauren R. Weinstein, Henry Holt, 240 pages, $16.95. Weinstein masterfully relates just about every painful, cringe-worthy aspect of adolescence, from desperately trying to fit in with the cool kids to realizing your first love isn't as wonderful as you first thought. Thankfully, she chronicles such rites of passage (most of them autobiographical) with incredible wit and good humor. Far from being any sort of mopey, dour affair, "Girl Stories" is a hilarious tour de force. The sort of book where you wince while laughing. "Mine Tonight" by Alixopulos, Sparkplug Books, 104 pages, $10. For his debut graphic novel, Alixopulos tells a multilayered story about a down-on-his-luck guy who is trying to recover money for a billionaire who wants to contribute to Kerry's 2004 campaign. Convoluted? Yes, but never confusing, thanks to the author's spare, sketchy layouts and character designs. Alixopulos also conveys a wistfulness that helps undercut the political tone and keep the book from coming off as strident. Overall, it's a good first book and I look forward to seeing what he does next. "Krachmacher Number Two" by Tim Campbell, $6. I like this second issue of Campbell's irregular series better than the first, despite the lack of color. That might be due to the fact that the main story ("At the Shore") seemed less grating this time around. Also, the appearance of a zombie wearing swimming trunks and goggles is always a plus. "Bugbear" and "The Beast Mother," by Drew Weing and Eleanor Davis, $6 and $5. The super-cartooning team of Weing and Davis put together some breathtaking mini-comics, both together and on their own. Both of these two little books are well worth your time, but so is just about anything they make. Visit their Web site and buy something, won't you? "Let's Do This" by Jeremy Arambulo, $4. Arambulo handed me this mini while I was schmoozing at the show. It's full of the usual autobiographical, slice-of-life stuff that a lot of young cartoonists attempt, but I like his clean art style and self-effacing sense of humor. He's put a lot of charm in his drawings, enough to make me want to see him try his hand at something a bit meatier.